Last month we talked about teaching our children how to disagree respectfully and about the danger of confirmation bias. Our school is about so much more than just teaching our kids the 3 R’s or how to hold a pencil correctly. Woodland Hills Private School is known for teaching kids to be deep critical thinkers. While critical thinking certainly applies to literacy, math, science and social studies, it more broadly—perhaps more importantly—applies to how we take in information. And, one way great schools promote this kind of higher-level critical thinking and also develop empathy in children is by exposing them to a variety of diverse perspectives. We are preparing children to enter an increasingly global society where their ability to work with people across a wide variety of cultures is at least as important as their academic skills. One way we can promote this kind of learning and continually broaden our children’s world view is through great literature that provides a window into other cultures. Multicultural children’s literature can help children develop appreciation and understanding for other cultures and promote their thinking about social justice. Tolerance is often the go-to term when we think about multicultural education, but I believe tolerance is a low bar. Just as we want our children to learn to disagree respectfully and with genuine curiosity in their heart and mind, we also want our kids to develop a well-informed paradigm of society. We have an opportunity to raise children who have less unconscious bias than the generation before them. And, books are a great springboard for accomplishing this. With that being said, this infographic should alarm you. It is one of many examples of bias in the canon of available children’s books. 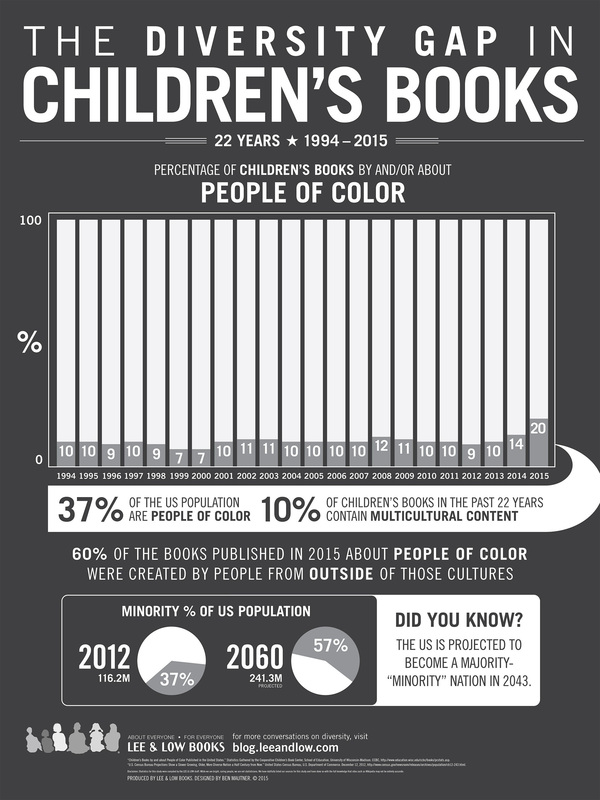 The Cooperative Children's Book Center at the University of Wisconsin-Madison has done some of the most extensive research on diversity and bias within children’s books and has found that children’s literature in the U.S. is overwhelmingly white, full of gender and racial stereotypes, and severely under-representative of people with disabilities. This is just looking at books published in the past 20 or so years. We might not even realize that some of our coveted childhood favorites, such as Little House on the Prairie, are not free of bias. Now, we don't need to ban such books or remove them from the school library, but we have a special opportunity, or perhaps a moral imperative, to teach our children about bias and stereotypes—in a developmentally appropriate way—so they can think critically about how they take in this information. And that is exactly what some of our classrooms began to do in December. After a classroom discussion on the topic of diversity, some of our 3rd, 4th and 5th graders spent time brainstorming different forms of diversity they are aware of. After sharing their ideas on diversity, they decided to start by looking at two manageable topics, gender and race. Each student selected a genre (historical fiction, realistic fiction, nonfiction, sports, etc.) and gathered 25 books. In a Google Doc, they tallied up how many books showed only white people on the cover and how many books showed only male characters on the cover. Breaking it down by genre enabled them to look at sectors of the library to see, for instance, if the majority of sports books were about boys or how many realistic fiction books featured persons of color. It turned out that our classroom libraries did much better than the national average at reflecting people of color and bucking gender stereotypes. However, the students felt that there was still room for improvement. Having just studied persuasive writing in Writing Workshop, the students felt a call to action. They wrote persuasive letters advocating for literature that fully reflects our diverse society. As one student put it in her persuasive letter, “14% of children’s books in the U.S. represent diversity [citing the national average according to Scholastic]; that means 86% don’t!” Some letters were written to our school administration in the hopes that we will urge the school community to take action. I suspect this is just the beginning of many meaningful conversations in our school about valuing, not just tolerating, diversity and about ensuring that our libraries reflect a broad spectrum of race, culture, religion and gender differences. If you feel inspired by some of the work our children have begun, you might wish to broaden your home library or donate some books to your child’s classroom. While there are a number of cultivated book lists available, here is one list that allows for sorting by topic and age-level. It’s a great place to start when looking for multicultural books and books that promote social justice. You can also keep it simple, like our students did, and preview books before you buy. If there are no main characters who are persons of color, the characters seem to have stereotypical gender roles, and everyone is able-bodied, you don’t have to put it back. But, it's always good to maintain a critical eye and see if these books constitute a large percentage of your collection.